BREAK IT DOWN FOR ME, FELLAS. 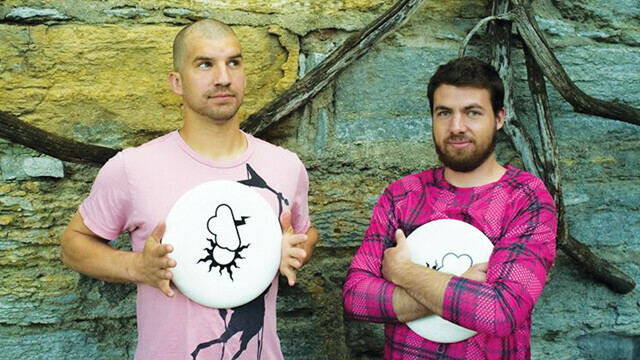 Ultimate Frisbee afficionados Chris Schasse, left, and James Wagner are the creative team behind The Break Side, a web series about their favorite sport. Back in June, we shared a short story about two locals, UW-Eau Claire student Chris Schasse and his friend and UWEC alum, James Wagner, who were taking off to spend their summer vacation traveling the western U.S. filming a documentary about the subculture adjoining their favorite unconventional sport: Ultimate Frisbee. Chris and James have returned from their journey and are ready to debut the first episode of their documentary series, The Break Side. After reaching their $2,000 Kickstarter.com fundraising goal, filming began in early March and the trip began on June 11 with the pair returning in late August. In that time, Chris and James covered Colorado, Arizona, California, Oregon, Washington, Montana, Wyoming, and Iowa. Since their goal was to profile the people of the Ultimate community around the country, they would arrive in a new city, try to find a Facebook, Google, or Yahoo group or anything to connect with the Ultimate community there and reach out to the players – trying to find someone with a cool hobby, passion, or story to tell. Aside from a few family members, they didn’t know anyone they stayed with or spent time with throughout the summer, but they still keep in touch with many of their new friends. Although they seemed to enjoy pretty much every aspect of their journey (for good reason), James highlights his favorite memory from putting The Break Side together: “One of the last nights of our trip, Schasse and I were sitting on the roof of an abandoned barn, drinking beer and talking about the summer. To our left was an amazing sunset, to our right a full moon was rising, and straight in front of us the sky streaked with lightning. It was like everything that we could have wanted to see, we were seeing in that moment. That’s how the whole summer was: Everything we could have hoped for, we got to see.” Schasse adds that the episodes’ entertaining and engaging attitude allows the view to feel the “energy, acceptance, and passion” of the people they met. This filming style is precisely what led to the decision to film episodes instead of one documentary. James says the trip was “way too chaotic” for that style and that although some themes emerge, this style just made more sense to them. One of the biggest differences between The Break Side and many documentaries is that the creators work themselves into the episodes. Since their filming methods changed as they went, every episode will look different than the last. Chris and James hope people just enjoy each episode as fun and unique and “that they see all the experiences that can be had through travel and networking.” They say they are just two regular guys who decided to have some fun for a summer, and chose to film it and show it to anyone who wants to watch. Their goal wasn’t to produce the perfect documentary film, but to enjoy themselves and have others enjoy what they made. The series will premiere with the first four episodes being shown at the Woodland Theatre in Davies Center at UW-Eau Claire at 7pm Jan 28. These episodes will also be immediately available at www.thebreakside.com. Future episodes will air online each Tuesdays at 7pm. Chris Schasse and James Wagner traveled all over the west coast one summer, getting an inside look at the sub-culture of Ultimate Frisbee.